I don’t know too much about Owen’s early life, so I will start with my own. 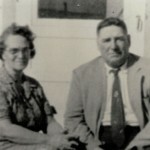 I was really born of goodly parents, Samuel R. Haslam and Eliza Charlotte Broadbent. I don’t remember too much until I was almost six years old. My grandfather came from Wellsville, Utah to visit, I think it was in August, 1905, and when he got ready to go home he talked my father into letting mother and us children go back with him. There were three of us, myself and Ella (who married Roy Wilson), and Samuel Evan. We stayed until in September, when school started and I, being six at the time, started my first schooling in Wellsville, with a teacher named Miss Smirthwaite. I remember this being the name but am not sure of the spelling. Then my grandfather wrote a letter to my father telling him that he was keeping us till my father would come and take us to the temple and have our work done. So just before Christmas, father arrived. I remember that so well, because he was on crutches. He was building on the house and in trimming logs his axe slipped and cut his foot and to make things doubly worse, he fell off the house while shingling it. Grandpa, being in practice, because it seemed that every time anyone got things wrong with them, they came to grandpa for him to doctor them. I often wondered why until not too long ago I found out that his father was a doctor. So he must have taught my grandfather a lot of things. Anyway, he soon had my father on his feet again. After the first of the year, 1906, we went to the Logan temple and were made an Eternal family. That was the last of my schooling until September rolled around again, and I was seven years old. You will know by this time, after looking at dates, that I was born in 1899. The day was September 12. But as I look back, and think of it we lived so far from school that I didn’t start till Ella was old enough to go, so I-was 8 before I got to go again. as fast as we piled on. That was one time I was glad for deep snow. But as we got older we walked, deep snow or not, we walked. I am glad I learned to walk, I still do it. middle to keep them going. Every once in a while he would crack the whip so there was no letting up. I never remember him ever hitting a horse. it over. One horse we rode was always determined to go into a lake to have a drink, and if we were unable to stop her, she would go out into the middle where it was the deepest and lay down. Come out of that without getting wet if you think you are smart enough. I can’t leave school days without telling about the spring thaws. A big coulee divided our land and we had to cross it, walking from one end to the other to find a place narrow enough to jump. Ella and I could mostly make it and Evan and Bob. One time I jumped over and Ella was to throw Pete across and I catch him. Well, she did manage to land him in the middle of it. A good laugh now but a concern at the time. At Christmas time grandpa and grandma Broadbent insisted the whole family come to their place for the celebration. Mother would go over and spend days and days cooking and preparing for the event. I think there were almost a hundred at the last one. It was fun skating, sledding, and tipping over. The young people of the ward had their sleigh rides and they were fun. Also the hay rides. They were fun too. 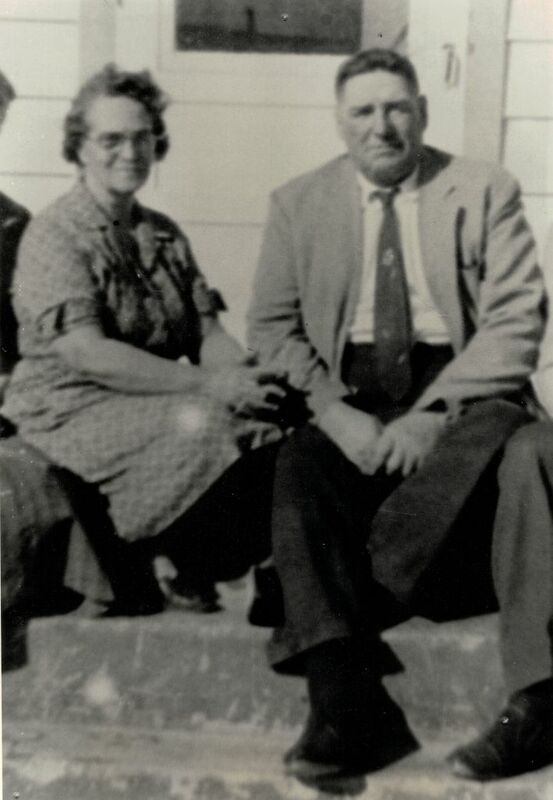 In September of 1919 Owen and I were married. His parents were John Ephraim Redford and Sarah Almyra Leavitt. Both our parents came from Wellsville, Utah. After our marriage I remember baseball games. Going across the reserve with a team and buggy to Glenwood and Hillspring. Leavitt was successful in winning most of the games. The Indians didn’t mind us driving across the reserve as long as we stayed on the road. And what was wrong with that? The Indians were only asking what any decent person would ask for themselves. Who would want anyone driving all over their land whenever they pleased? We did respect their rights and property. It was only fair that we should. In the winter time each ward would put on a play. All were different and each would take their show to the other wards. Leavitt, Beazer, Mt. View, Hilllspring, Glenwood, and Etna. It was good variety. It seemed Owen always got to be the driver and some of those drives were long and cold. It started before we were married and for a long time after. He would be out in the cold, sometimes walking to get warm, while the others were cuddled down under blankets with hot rocks to keep warm. I wonder how much he was appreciated for it. No one ever volunteered to change him off. Owen bought a thresher and did custom work, going to out of the way places where no one else would go. We had many trials and heartaches in our lives but we went through them together and each trial only seemed to make us appreciate each other more. We had six children, three of whom are still living, and they are the best and so are their families. Our first child to die, a little girl, died in 1924. Then our oldest, Sidney died in 1941. He was twenty years and 5 months. That was hard. The next one, a little girl, died in 1943. Owen passed away in 1976, in June. We would have celebrated our 57th wedding anniversary in Sept.
We have both been active all our lives and have seen and helped in the progress of many things. Our trials were never tragedies because we didn’t make them so. Our testimonies only grew stronger with each one. We have lived from horse and wagon days to airplanes and it is nice to fly, but thanks for the ability to walk. It has come in handy many times and it still does. I now live in the Chinook Lodge. Not to be waited on, but to be able to go places where my feet can take me. I still do everything for myself and am blessed in doing it. My family live in the United States and I am still able to visit them and these are precious opportunities for me. And living here at the Chinook I can lock up and know that everything will get the best of care while I am away. People here are so congenial and live wonderfully well together. The staff is a wonderful group and the matron is tops. Life is good and I am enjoying every minute of it. And why not, because I do not know how many more I have. A wonderful family, a wonderful country, even all our trials have helped to make it wonderful. Yes, life is good. My Cousin Bob © 2019. All Rights Reserved.